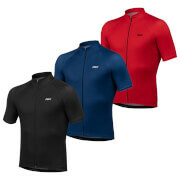 The ‘Stelvio’ jersey is PBK’s take on the popular water-resistant, all weather jersey that has swept the peloton in recent years, proving popular with both amateur racers and club riders. The water resistance and dynamic breathing of the Hydrophilic membrane make this a must have in every rider’s wardrobe. 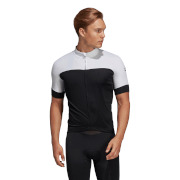 A key feature to this jersey is the temperature regulation. The fabric is akin to a one way door for moisture – it lets perspiration out, but does not let rain in, maintaining warmth, remaining windproof and keeping out all but the worst of rain storms. Thanks to the reactive technology, heat loss is regulated to keep you comfortable on the longest of rides. Due to the fabric being treated before production, it maintains its water repellence for up to 10 years. We’ve kept the fit true to Italian heritage, and therefore would describe these jerseys as a close, Italian fit, similar to the likes of Castelli and Sportful. If you are not used to Italian fits, try sizing up.